First appearance of the HOK at NATC, Patuxent River, MD took place between 19 November and 16 December 1954. HOK-1 BuNo. 125531 was flown here by Kaman Test pilots as part of the Contractor's Aerodynamic and Structural Demonstration Tests. The Navy's "Board of Inspection and Survey" (BIS) program project flying started on 22 Dec 1954. Aircraft BuNo. 129810 and 129811 were delivered on 17 December for the BIS test program. Aircraft 129810 was assigned to NATC 's Service Test Division and aircraft 129811 to NATC 's Electrical/Electronics Division. On 16 Jan 1955 HOK-1 129812 crashed. The in-flight loss of a blade servo flap following an abrupt collective control input, caused the aircraft to crash. All HOK-1 trials were suspended until 21 July 1955. 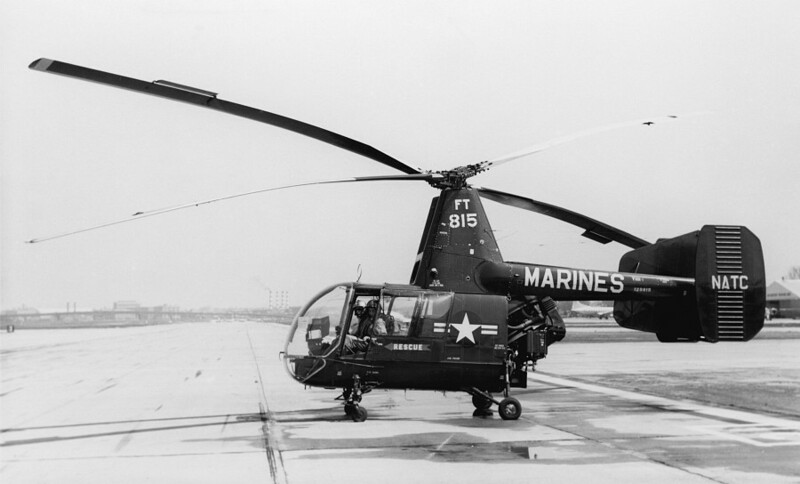 A modification program was set up by Kaman and thirty-nine aircraft changes were incorporated. The so-called Kaman Report W-18 configuration. A majority of the changes were either corrections for improved service use or items and/or areas of a further development nature. HOK-1 129815 was delivered to NATC Flight Test Division on 22 June 1955. As YHOK-1 it was used for the Preliminary Flying Qualities and Performance assessments associated with the BIS trials. The testing commenced on the 23 Jun 1955. An inspection to detact any major deficiencies in the physical arrangement of the aircraft. 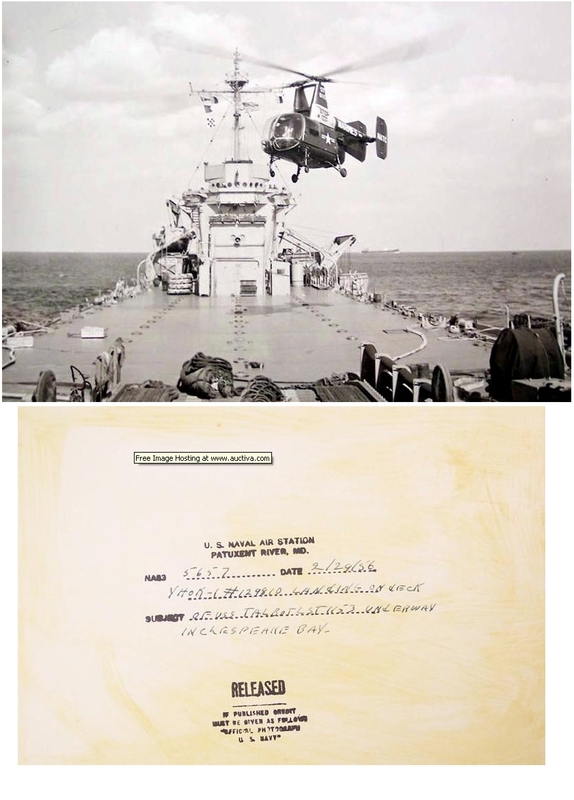 Test to determine approximate performance in order that a preliminary comparison could be made with guaranteed values specified in : “BuAer report - Detail specification for model HOK-1 helicopters of 18 Sep 1950” . Test to detect any serious adverse control characteristics. For the Service Test Division the BIS trials resumed on the 21 July 1955, when YHOK-1 129810 returned from modification work at Bloomfield, CT. Since the recommencement of flying on 21 July 1955, evacuation, liaison, observasion (reconnaissance) and all-weather capabilities of the HOK-1 were investigated during 66 flights (96.2 hrs). The evacuation and liaison missions were emphasized. Small, obstructed, unimproved landing sites were utilized. On evacuation missions both dummy and life “patients” were carried. The litter racks were utilized and the loaded litters were removed and replaced 78 times. Approximately 456 landings were made at sites of unimproved rough terrain. Swamps, beaches, plowed fields, rutted dirt roads, and similar areas were selected to simulate operational conditions. The instrument capabilities of the HOK-1 were investigated in point-to-point flying and range approaches under the hood in relatively smooth air. Hands-off hovering and forward flight were possible for limited periods in mildly turbulent air. The autorotational characteristics of the HOK-1 were good. During autorotation the rate of descent and controllability were satisfactory and full autorotational landings were easily executed although care had to be exercised to keep from dragging the tail. The lower surfaces of the vertical fins of the empennage struck the ground on several occasions during such landings.This usually resulted in minor damage to the fins although on one occasion replacement of the fin and stabilizer assembly was required. Since the modification program no cases of blades striking the lead/leg stops and the rotor hubs were observed. The top aft corner of the starboard vertical fin was struck by the main rotor blades during a down-slope rough terrain landing. The pilot instinctively brought the cyclic stick aft of neutral when the nose wheels sank in soft sand. The collective pitch was fully depressed at the time. A total of 311.1 man-hours was expended in the maintenance of BuNo 129810 for 96.2 hours of flight , for an average of 3.2 maintenance man-hours per hour of flight. Twenty-nine of these man-hours were required to perform a 120-hour inspection. HOK-1 129837 was evaluated for utility and plane guard mission aboard the U.S.S. Tarawa (CVS-40) during the period 30 July – 12 August 1956. Navy pilots flew the helicopter for a total of 35 hours under a variety of conditions apparently typical of those encountered by fleet utility helicopters. These conditions included actual as well as simulated emergency missions, night as well as day flying, 25-30 knot winds and sea state 3, in addition to almost ideal weather conditions. Concluded was, that the HOK-1 was well adapted and suitable for the plane guard and shipboard utility mission for reasons like : a) Superior visibility for pilot and crewman, critically necessary for plane guard, guard mail, personnel transfer ; b) Ease of deck handling and positioning, 4-5 man and one steering bare being the maximum requirement; c) Blade dephasing not required for elevator transport, thus permitting helicopter take-off in minimum time ; d) Ease of blade dephasing ; e) The helicopter is easy to maintain. For example, a 120 hour check was accomplished during cruise with 12 manhours. 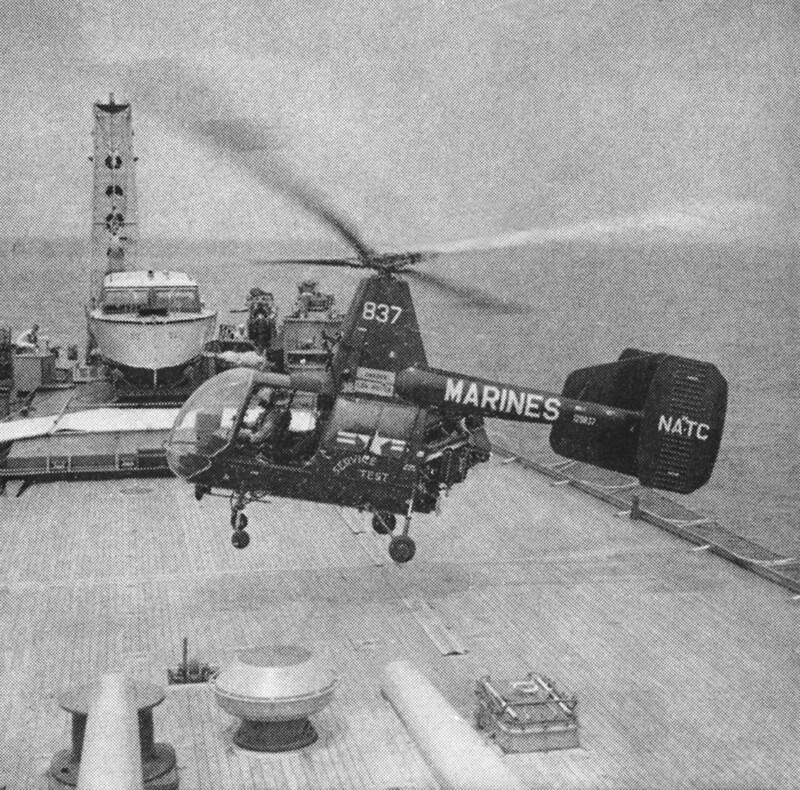 See picture of HOK-1 129837 during landing on deck of USS Newport News, here below. While the HUS and HOK were flying plane guard, on 01 August 1956, an AD-5 went into the water off the bow of the carrier due to a catapult malfunction. The HOK had the pilot in the sling 50 seconds later and in less than 3 minutes elapsed time the pilot was back on the deck of the carrier. Nothing could attest better to the operational suitability of the helicopter to the prime requirement of the plane guard mission. 129812 and 129813 , which were at Bloomfield, were assigned to FASRON 4, San Diego, CA as of 08 Jan 1955. They were used by NATC pilots of the Service Test Division for flight testing during their ferry flight. However, aircraft 129812 crashed on 16 Jan 1955 over Chesapeake Bay, close to NAS Patuxent River. HOK 129813 was returned to Kaman, Bloomfield, CT.
" I was on active duty as a Marine Corps officer and pilot from November 1954 to May 1957, and in the Reserve until 1962. To support the following facts, my flight log shows flights of HOK-1 's in September 1955 at Patuxent River NATC....... " . 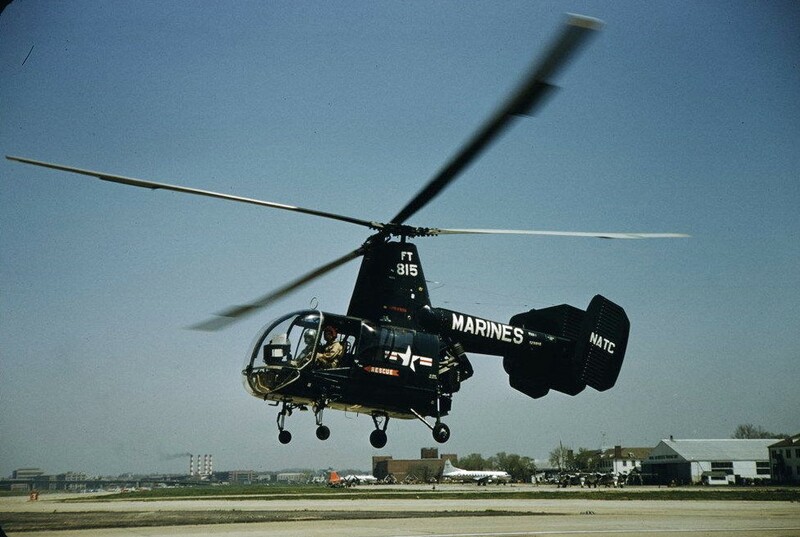 The HOK-1 was flown at the NATC at Patuxent River as early as March 1955, before it was placed in service with Fleet Marine Force units. These were so called BIS-trials. Marine Corps line pilots were assigned to put the machines through the various flight regimes that would be required for field performance after delivery to the Fleet Marine Corps units. Information from these flights was also used to determine serviceability and maintenance requirements. The BIS trials were begun only after factory flight testing had been completed. On 16 January 1955, HOK-1 BuNo. 129812 disintegrated in flight over the Chesapeake Bay, killing the pilot. The BIS trials were suspended until the accident investigation was completed. In September 1955, the BIS tests were resumed with five Marine Corps pilots participating. On 23 September 1955, another HOK-1 (BuNo. 129814) crashed in the woods a few miles north of NAS Patuxent River. The pilot was killed. The BIS tests were again suspended until the accident investigation was completed.